Eau Claire Restaurants | The Livery Restaurant and Saloon | Modern Comfort Food with a Twist! The Livery is downtown Eau Claire's neighborhood saloon and grill and the hottest local restaurant for lunch, dinner, or drinks. Our menu features good ol' comfort food – with a modern twist! We're cookin' up new items daily, and only use the freshest ingredients to make food that you'll crave. Bonfire Every Night! Enjoy our outdoor seating for a meal, or just hang out around the huge fire pit. Take a stroll upstairs in the livery and you'll be amazed to find a lot of additional dining space. We use the space for general dining, we can accommodate large groups of 25 or less. To find out more information, contact our Manager, Jason/Adam at (715) 833-7666 or send an e-mail. Come out and enjoy our full bar featuring regular happy hour specials, a wide range of beers, and friendly bartenders who will make you a real cocktail. Start making plans tonight! Take a look at the latest specials and events going on at The Livery. Sign up for our e-mail list to hear about our latest offers, news and more! Modern comfort food to tickle your taste buds. What'cha Craving? Mmm.... juicy burgers, delicious sandwiches, fresh seafood, a variety of soups, salads, and appetizers...The Livery caters to any taste. All of our food is made from scratch with fresh ingredients, including lots of local and seasonal goodies. Our chef creates new dishes daily, evolving and adapting the menu based on what you're asking for. There are always new flavors and combinations to try, making The Livery a great place to visit again and again. 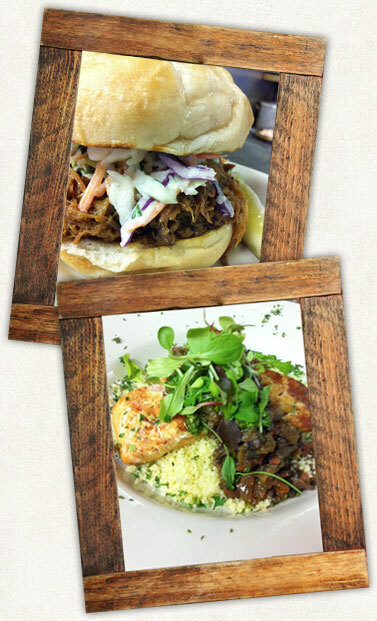 Check out some of our tasty menu items below. Then take a peek at our photo gallery and lay your eyes on our most creative dishes at The Livery! The Livery also offers lighter fare, gluten-free, and vegetarian dishes. Have yourself a real cocktail. Get Bucked Up! At The Livery, you'll find more than just your standard drinks behind this counter. Our savvy bartenders will mix you the perfect Mojito with fresh mint and real fruit puree or a homemade spicy Bloody Mary that will knock your socks off. 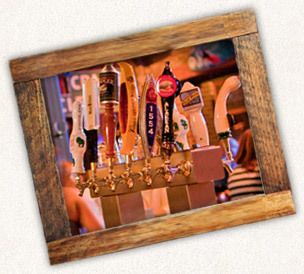 If a brew is more your style, try one of our 12 craft beers or specialty bottles. Try our seasonal, made-from-scratch creations. Live on the Edge. Our chef and bartenders at The Livery are always coming up with some crazy dishes and drinks, adding something new daily. Our Friday-Flippin'-Frenzy-that-Feeds-Famished-Fish-Fanatics (a literal AND metaphorical mouthful) is one of our regular and most popular specials. See a list of specials below and see what we're experimenting with this week! $3 Microbrew Taps, $2.50 Domestic Bottles, $3.00 Rail Mixers, $3.50 Call Mixers and many more! Choose us for your Friday fish fry. It's only $9.99! $3 Taps, $2.50 Domestic Bottles, $3 rails mixers, $3.50 calls mixers all frickin' day! Get on down here and have a few! Whether it's St. Patty's Day, Halloween, Graduation Night, Earth Day, Black Friday, or the first day of summer, we find a way to celebrate at the Livery. When you're all out of gift-giving ideas or just don't want to set foot in the mall, give the gift that anyone will appreciate – food! Grab a gift card from The Livery and show people that you care enough to give them the very best…gift card. They're great for last minute, or for redeeming yourself when you forgot to get a gift. Either way, you come out a winner! we could go on, but we'll let you see for yourself! Drooling is definitely allowed, just keep it off your screen. 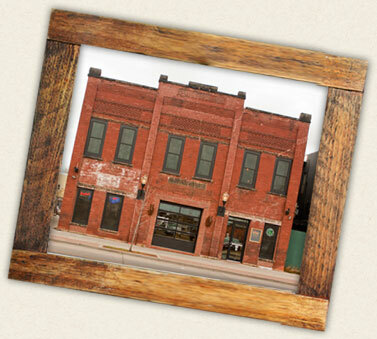 The Livery Restaurant and Saloon, located in downtown Eau Claire's North Barstow District, is one of the area's newest and most popular restaurants. Known for its smashing cuisine and made-fresh drinks from the bar, The Livery has quickly gained a following of loyal fans. Opened in 2009, the locally-owned restaurant features a casual, fun atmosphere with a full bar, ample seating on two levels, “Game” room, and private outdoor patio with a huge brick fire pit. You can enjoy the evenings indoors or out – or both…the garage doors in the front and back are opened up during the warmer months to create a truly unique setting for social gathering and imbibing. The Livery is located within walking distance to the popular Phoenix Park area, and is a neighbor to several shops and service businesses in the North Barstow redevelopment area. It's easy to find, easy to get to, and has plenty of parking available. Hey Guys – tired of just sitting around watching the TV over the bar, or standing around trying to find something to chat about? 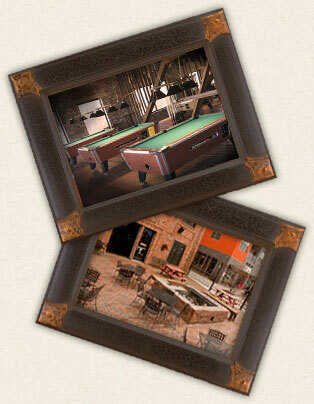 Keep yourself entertained in the “Game” Room at The Livery. It includes arcade games, pool tables, darts and of course, the mounted big-game animals on the walls (we'll let you come up with your own story for those fellas). The Game Room can also be used for private parties (up to 60 people). Every night is a great night for a bonfire at The Livery. There's plenty of outdoor seating around the huge brick fire pit to gather, whether it's summer or winter. Bring your stogies and your drinks out to the patio and enjoy the fresh outdoor air. Take a stroll upstairs and you'll be amazed to find a lot of additional dining space! 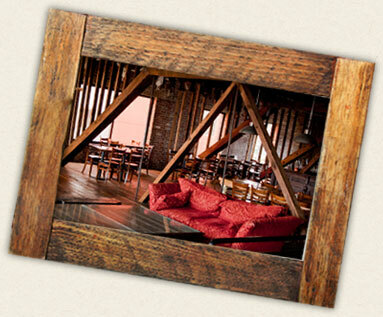 We normally use this space for evening dining with a more intimate setting and a great rustic atmosphere! The Livery building is a historical icon in Eau Claire, as it once served as Oleson's Livery (owned by George and Peter Oleson) from the 1880s to the 1920s. It remains one of the few liveries still intact and in use. Now, back in the day, liveries were an integral part of city life – offering horse transportation to those who could not afford to own a horse of their own. Liveries are also the reason why business/commerce gathered close together, forming downtowns. It was a shorter distance for the horses to travel. As the economy transformed and automobiles started making long-distance travel easier, the livery building was modified into an automobile garage and has since housed numerous auto-related businesses. Today, it is of great significance that the original Oleson's Livery building remains a solid structure, and is once again part of transforming the culture of Eau Claire's downtown area. The North Barstow area continues to grow and offer more amenities, services, and entertainment to nearby residents and workers, including the newly constructed mixed-use buildings for apartments and retail. Come Get Lucky! Sign up for our e-mail list below. For security purposes please verify that you have checked the box marked "I'm not a robot" and hit submit again. Thank you.